Fruit of dragon blood tree is small berry filled with 1 to 3 seed. Ripe fruit is orange-colored and it can be seen on the tree 5 months after pollination. The dragon blood tree is an iconic tree native to the Socotra archipelago, part of Yemen, located in the Arabian Sea. Birds eat fruit of dragon blood tree and facilitate spreading of seed in the wild. The famous red resin that gives it its name is exuded from the bark after wounding. Leaves of dragon blood tree are used as a source of food for goats during the periods of drought. Injured bark and branches release red resin which is why this plant is known as dragon blood tree. Resin of dragon blood tree is used in treatment of diarrhea, superficial wounds, bleeding, ulcers, dysentery and fever. The dragon blood tree is a succulent, very hardy and drought tolerant. It enjoys warm temperatures and sub-tropical conditions. Starting from the 18th century, resin of dragon blood tree is used as varnish for the violins. It is also frequently used as a toothpaste, lipstick, glue for the pottery and as a source of red pigment for dyeing of wool. It is usually found at elevations of between 300 and 1,500 meters (980 and 4,920 feet). Resin of dragon blood tree is often used as incense. Thanks to its unusual color, it is inevitable part of various magic rituals. The dragon blood tree has a unique and strange appearance, with an “upturned, densely packed crown having the shape of an uprightly held umbrella”. Wood of dragon blood tree is used for the manufacture of beehives, while leaves are used for the manufacture of ropes. Dragon blood tree blooms during February. Dragon blood tree produces small, fragrant, white or green-colored flowers at the end of the branches. The fruits take five months to completely mature. The fruits are described as a fleshy berry, which changes from green through black to orange-red when ripe. The fleshy berry fruit contains one to three seeds. The berries are usually eaten and dispersed by birds and other animals. Dragon blood tree produces long, thin, stiff leaves at the tips of the young branches. They last 3 to 4 years and one of their main purposes is to absorb moisture from the air and transport it to the root. Dragon blood tree is monocot plant. Even though it doesn't have phloem and xylem like other woody plants, it has secondary thickening of the stem and root. 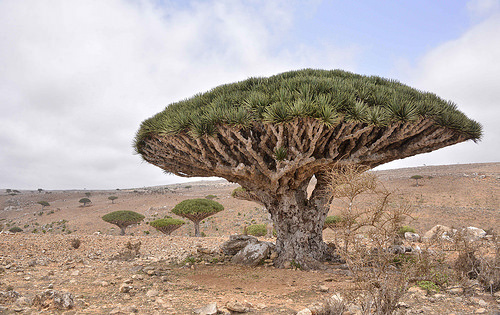 The first description of the dragon blood tree was made during a survey of Socotra led by Lieutenant Wellsted of the East India Company in 1835. The dragon blood tree has been the major commercial source of this resin, and many myths surround the unusual trees. The local inhabitants of the city in the Socotra Island use the dragon’s blood resin as a cure-all. Greeks, Romans, and Arabs use it in general wound healing, as a coagulant, cure for diarrhea, for dysentery diseases, for lowering fevers. It is also taken for ulcers in the mouth, throat, intestines and stomach. Extremely dense crown is made of numerous branches characterized by dichotomous branching (each branch divides twice). Parasol-like crown keeps the root in shade, prevents fast drying of soil and protects seedling from the harsh UV rays. Many species of plants and animals live in the shade of dragon blood tree. Dragon blood tree is perennial plant that can survive for hundreds of year under optimal conditions. In 1883, the Scottish botanist Isaac Bayley Balfour identified three grades of resin; the most valuable were tear-like in appearance, then a mixture of small chips and fragments, with a mixture of fragments and debris being the cheapest. Because of the belief that it is the blood of the dragon it is also used in ritual magic and alchemy. In American Hoodoo, African-American folk magic, and New Orleans voodoo, it is used in mojo hands for money-drawing or love-drawing, and is used as incense to cleanse a space of negative entities or influences. It is also added to red ink to make “Dragon’s Blood Ink”, which is used to inscribe magical seals and talismans. Dragon blood tree looks like giant mushroom thanks to its single trunk and umbrella-shaped crown. This plant usually grows to the height of 32 feet. There was also an 18th-century recipe for toothpaste that contained dragon’s blood. Dragon’s blood incense is also occasionally sold as “red rock opium” to unsuspecting would-be drug buyers. It actually contains no opiates, and has only slight psychoactive effects, if any at all. Dragon’s blood continues to be used in medicine, dyes, varnish and incense to this day. wounded when it fought an elephant. Another legend states that the dragon blood tree is related to the ancient dragon Ladon, who had one hundred heads and spoke in many different voices. When Juno (Queen of the Gods and mother of Mars) married, her mother Gaia gave her three golden apples and ordered Ladon to guard them in the Garden of the Hesperides. Hercules was ordered to steal the golden apples and so killed Ladon, and from Ladon’s blood sprang the dragon blood tree.